Over the last few years, there has been an electric revolution bubbling beneath the surface of the auto industry. Spearheaded by Tesla and their FREE charging stations, fossil fuel burning cars have been taking pugilist style blows, blows that have put them on their heels when it comes to the future of the gas-powered industry. After all, who is going to want to pay 3 to 4 dollars per gallon when electric companies like Tesla are offering re-fills (or re-charges to be more exact) for free? Facing the the inevitability of the changing landscape, all of today’s major automakers have been forced to draw new plans that will incorporate alternative energies. With the early successes of electric vehicles, it would be safe to assume that this would be the route that most companies would choose when deciding the fate of their future, right? Well, it all depends on who you ask. Currently, there seems to be a split between major manufacturers. Some are going electric, but many are actually going against the grain and investing millions of dollars in hydrogen fuel cell technology. This commitment was re-affirmed last week at the Los Angeles Auto Show when the world’s largest automakers– Toyota and Volkswagen– led the charge in announcing that they will be committed to making hydrogen fuel cell vehicles a sustainable future plan. How will they do this? 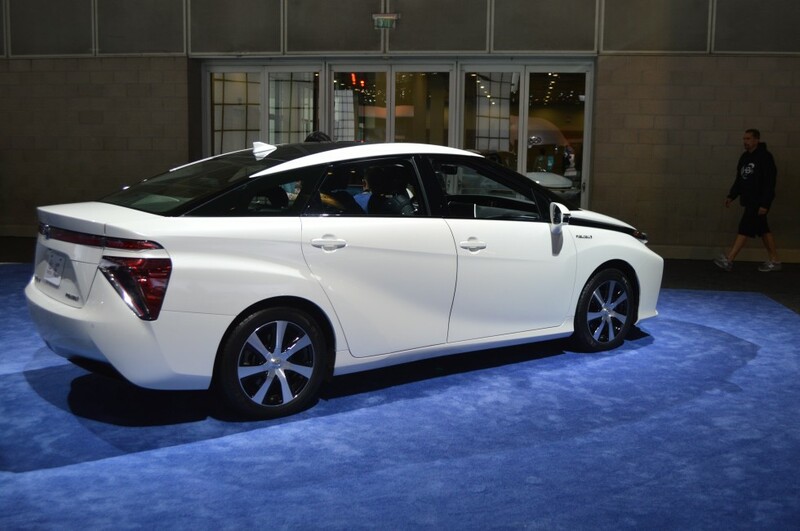 Further showing a commitment to this budding technology, Toyota also used the LA Auto Show to unveil their first production fuel cell car, the Marai, which will be available for purchase next year at $57,500. They were not alone, either. Honda, Hyundai, and Mercedes-Benz all indicated similar plans, saying that they will be debuting hydrogen fuel-cell vehicles in the upcoming months. Watching the LA Auto Show, it would definitely appear that hydrogen fuel-cell technology is here to say. 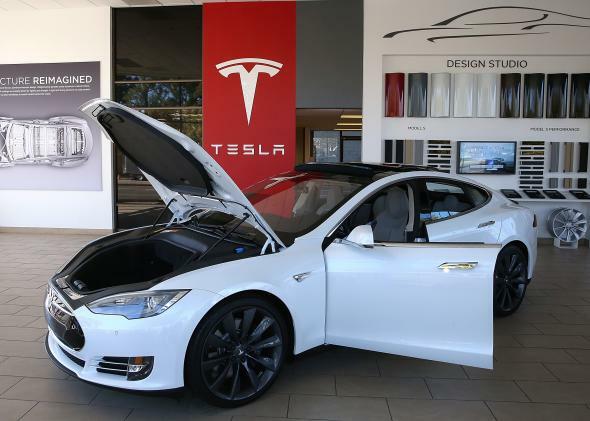 That’s a far way’s off the deals currently being offered by Tesla, a company that is offering free charge-ups to its customers! 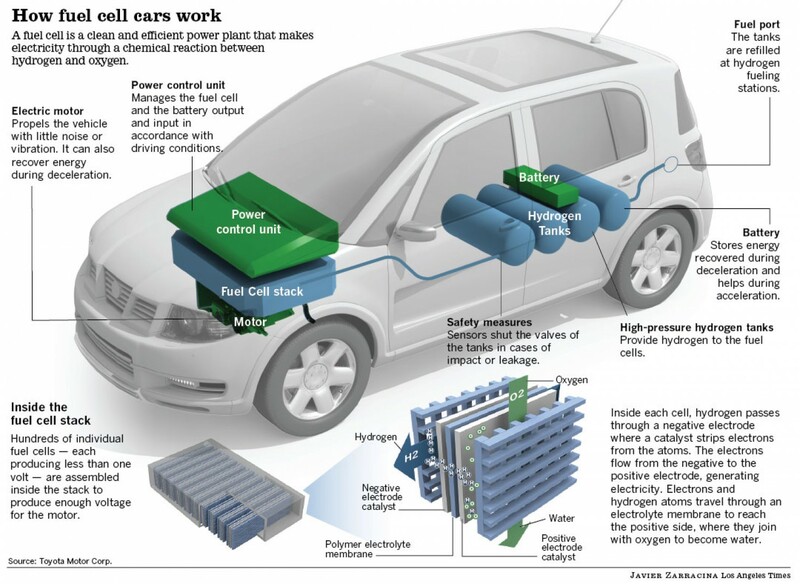 In a world driven by money, it’s obvious that hydrogen fuel-cell proponents still have a lot of strategizing and leg work to do to even compete with the electric market. Some experts predict that hydrogen could be reduced to $1 per gallon if mass produced, but creating that industry could take decades and billions of dollars. That, obviously, puts electric vehicles in the lead right now and gives them a huge head start to keep their lead as we head into the future. In a lot of ways, the emerging, fairly one-sided rivalry is reminiscent of the early days of the automobile. At that time, gas powered vehicles and electric vehicles were slugging it out for dominance (more than half of the vehicles on the road in 1900 were electric). In the end, however, gas emerged for one reason: economics. Today, the battle between hydrogen fuel cell vehicles and electric vehicles is much of the same, and because of monetary reasons, it will seemingly end with electric dominance. But Honda president Takanobu Ito warns us to not overlook the underdog. This entry was posted in Culture and tagged electric, hydrogen fuel cell, LA Auto Show, los angeles auto show. Bookmark the permalink.